Valentine's Day Writing Activity- Secret Valentine Writing Prompts. 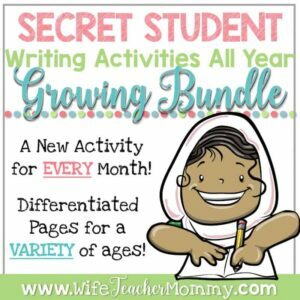 Your students will love this Valentine’s day secret student writing unit for the month of February! 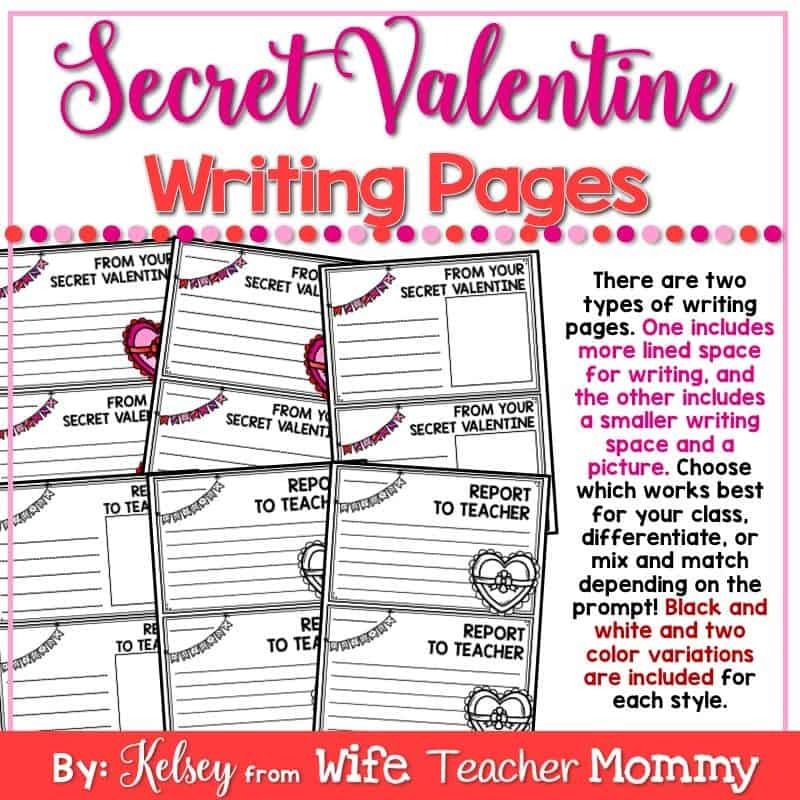 The unit includes fun valentine’s writing prompts for students to write to each other as their secret “Secret Valentine”. 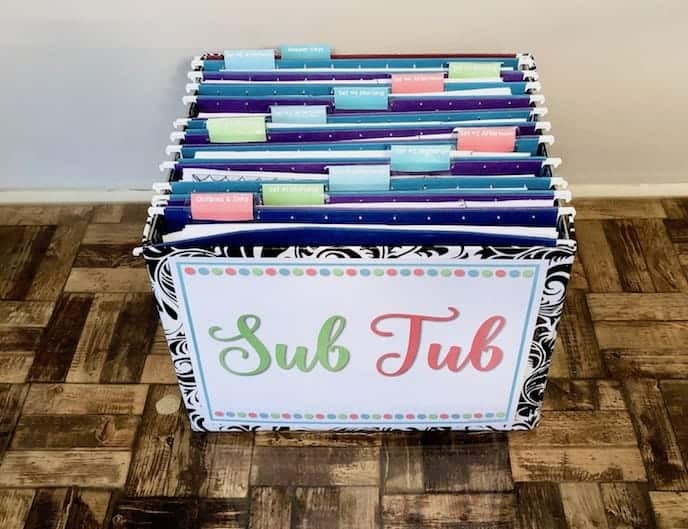 The students will love sending the letters to each other and doing kind things for their secret classmate. This editable Valentine’s day activity not only includes writing, but it is also a classroom community building and service learning unit. The unit is introduced with the original story “The Secret Valentine” Then, they will draw their assigned classmate, who they will be writing to for the duration of the unit. The students will have 10 writing prompts to write letters as a Secret Valentine. They will also have 4 accountability writing prompts in which they report their acts of service to their teacher. At the end of the unit, the students reveal who they are with a fun activity! WHAT’S INCLUDED IN THE SECRET VALENTINE WRITING UNIT? 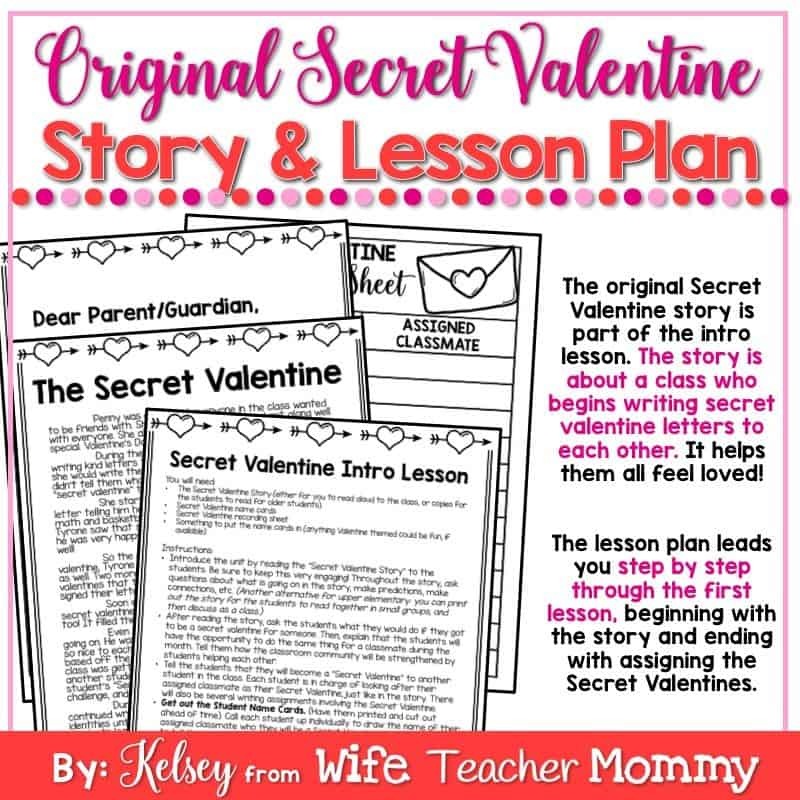 Secret Valentine Intro Lesson Plan and Original Story: This lesson plan is a fun way to introduce the unit using the original story. This will lead into the students becoming a “Secret Valentine” just like the main character in the story. Depending on your student’s age and ability, you may read the story aloud to them or print the story and have them read it as a reading passage. Writing Prompt Info: This page clearly lays out the two types of writing prompts: Secret Valentine writing prompts and Report to Teacher Writing Prompts. 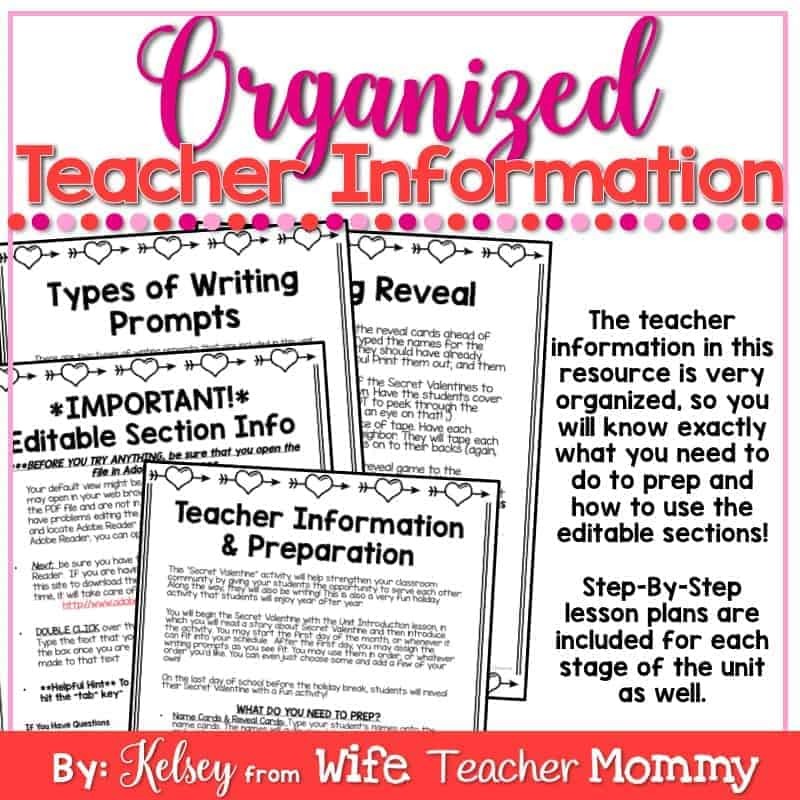 The Big Reveal Activity Lesson Plan: This reveal activity is a huge hit! The students will have a lot of fun guessing who their Secret Valentine is with this social activity. 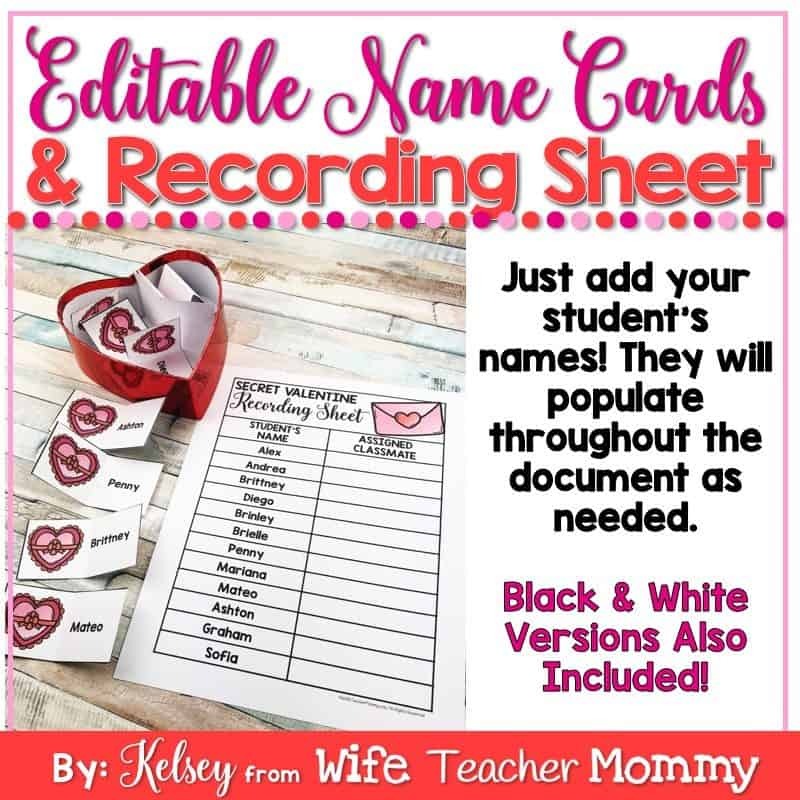 EDITABLE Student Name Cards: Add your students’ names to the student name cards so they are ready for the students to draw a name to become a Secret Valentine! EDITABLE Secret Valentine Recording Sheet: This adorable recording sheet is for you, as the teacher! This helps you keep track as you deliver the letters. It is also inevitable that students will forget who they were assigned to, so it’s great to have your list handy. 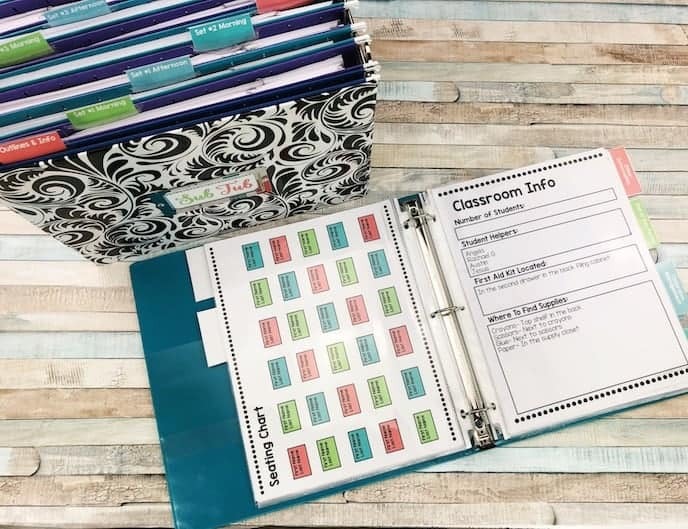 You can type the assigned classmate’s name, or print out the form and write them as the students draw names. Color and black and white included! 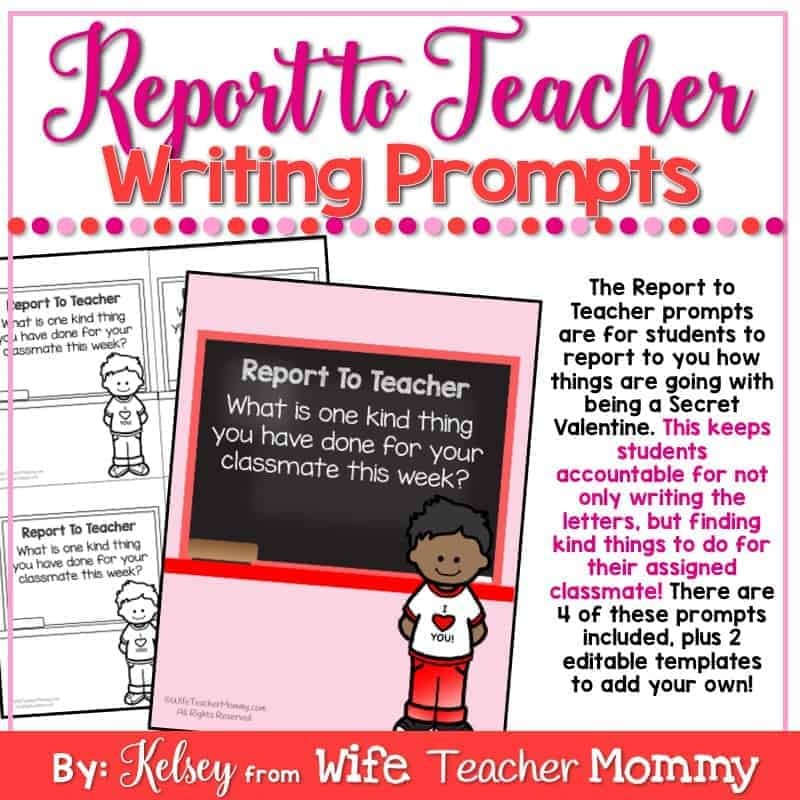 Secret Valentine Writing Prompts #1-#10: These prompts are what students will use to write their letters to their assigned classmate. There are 10 pre-made prompts included. EDITABLE Secret Valentine Writing Prompts: 6 editable pages for you to create your own! Secret Valentine Student Writing Pages- MULTIPLE VERSIONS! These will be used for the Secret Valentine writing prompts. There are three versions included. Two lined with different spacing, and one with half for writing/half for illustrating. Choose the one that works best for your grade level! 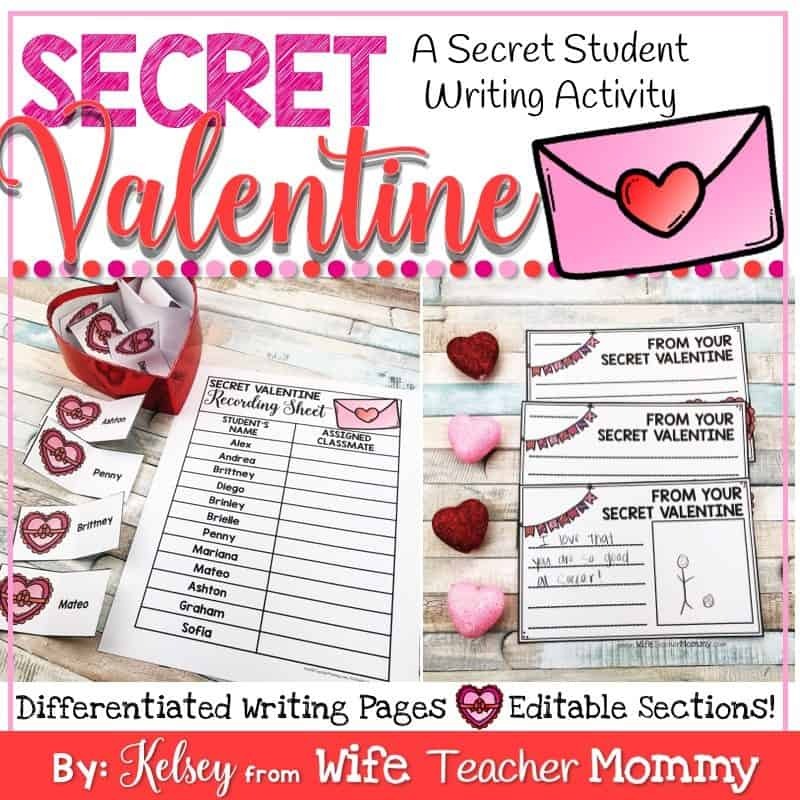 EDITABLE Secret Valentine Reveal Cards: The student’s names will automatically show up on these reveal cards to reflect what was typed into the initial student name cards, so they are ready to print! Just print them and cut them, and they are ready for the final reveal activity. Student “Thank You” Writing Pages: After the final reveal activity is complete, have the students write a thank you letter to the student who was their Secret Valentine.